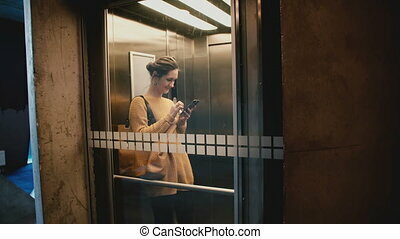 A view of young confident successful businesswoman riding down in transparent elevator using smartphone e-commerce app. beautiful caucasian female freelance worker using social networks website. 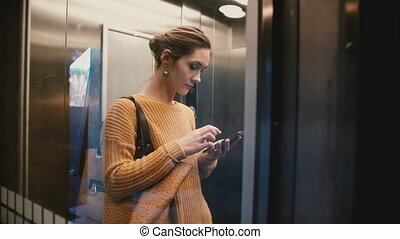 A view of attractive stressed busy Caucasian woman riding up in transparent elevator using smartphone mobile office app. Beautiful female executive using phone messenger while going to workplace. 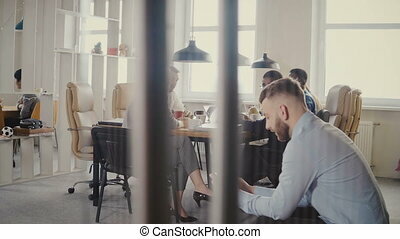 A view of young happy relaxed Caucasian girl riding down in transparent glass wall elevator talking on the phone smiling. Beautiful confident businesswoman on her way home from workplace. 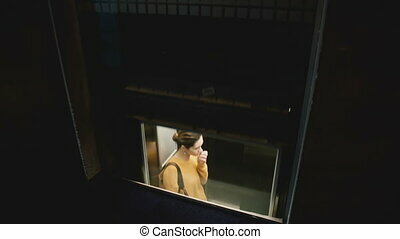 A view of young relaxed European woman riding up in transparent glass wall elevator talking on the phone and smiling. Beautiful female freelance worker using chat app to connect to friends. 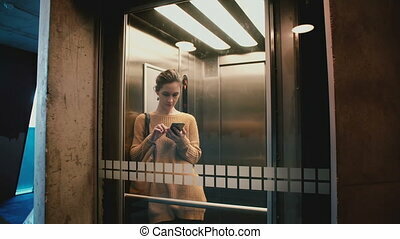 Young confident woman enters elevator, pushes button, door closes and she rides down using smartphone mobile office app. Successful beautiful Caucasian businesswoman using social networks website. Young happy smiling woman riding elevator with transparent glass wall, walking out using smartphone shopping app online. Successful beautiful relaxed female blogger typing messages on the phone. 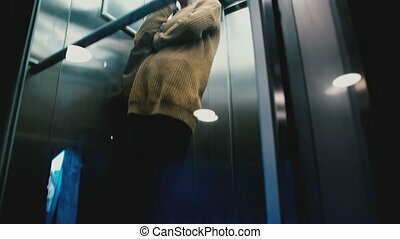 Young confident European woman pushes elevator button, door closes and she rides down, view through a glass wall. Successful beautiful businesswoman using a transparent lift in modern office building. Businesswoman with smartphone in subway car. Pretty young female commuter using messenger app online. Wireless 5G. 4K. Social networks. Shopping and e-commerce. Mobile office. Technology. Freedom. 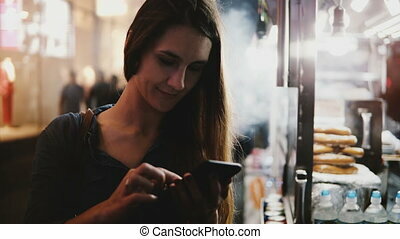 Happy attractive female CEO using smartphone e-commerce app near steaming street food vendor in evening New York City. 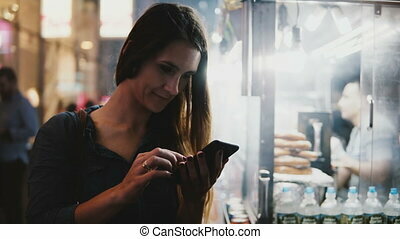 Confident young businesswoman using social networks to chat with friends outside. Casual female passenger on the train sits in a comfortable seat using smartphone e-commerce app, looking at the window. Relaxed traveler woman spending travel time chatting on social networks. Young beautiful businesswoman using the smartphone in office building. Busy female going down on escalator. Woman manager working in modern office, using mobile phone. 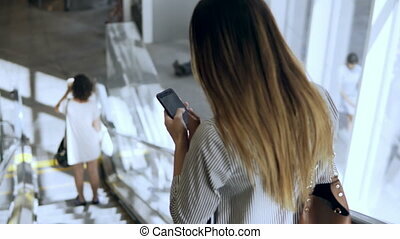 Young happy woman riding elevator with glass wall, door opens and she walks out using smartphone mobile shopping app. Successful beautiful Caucasian businesswoman typing messages on the phone. Dolly shot of multiethnic business meeting in modern office. Young successful European businessman using smartphone 4K. Managers collaborating and sharing partnership experience in stylish coworking. Beautiful local European businesswoman using smartphone messenger app near a steaming street food truck in New York City. Attractive successful happy blogger writing a new post using social networks. Young businesswoman working in modern office building. Busy female going down on escalator and using the smartphone. Female manager holding the documents and going to business meeting.